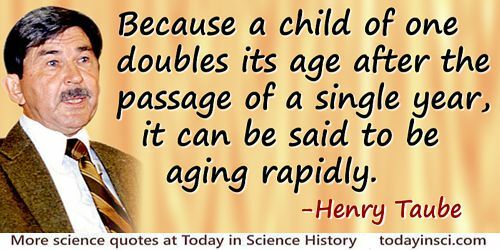 Because a child of one doubles its age after the passage of a single year, it can be said to be aging rapidly. Furnished as all Europe now is with Academies of Science, with nice instruments and the spirit of experiment, the progress of human knowledge will be rapid and discoveries made of which we have at present no conception. I begin to be almost sorry I was born so soon, since I cannot have the happiness of knowing what will be known a hundred years hence. I think that the unity we can seek lies really in two things. One is that the knowledge which comes to us at such a terrifyingly, inhumanly rapid rate has some order in it. We are allowed to forget a great deal, as well as to learn. This order is never adequate. The mass of ununderstood things, which cannot be summarized, or wholly ordered, always grows greater; but a great deal does get understood. The second is simply this: we can have each other to dinner. We ourselves, and with each other by our converse, can create, not an architecture of global scope, but an immense, intricate network of intimacy, illumination, and understanding. Everything cannot be connected with everything in the world we live in. Everything can be connected with anything. Concluding paragraphs of 'The Growth of Science and the Structure of Culture', Daedalus (Winter 1958), 87, No. 1, 76. In every section of the entire area where the word science may properly be applied, the limiting factor is a human one. We shall have rapid or slow advance in this direction or in that depending on the number of really first-class men who are engaged in the work in question. ... So in the last analysis, the future of science in this country will be determined by our basic educational policy. Quoted in Vannevar Bush, Science, the Endless Frontier: A Report to the President, July 1945. In Transactions of the Kansas Academy of Science: Volumes 48-49, 246. The pulse of a newborn during the neonatal period is very rapid … the pulse of old people is rather slow … the pulse is fullest and strongest in the prime years of youth. The specific qualities in diseases also tend more rapidly to the skin than to the deeper-seated parts, except the cancer; although even in this disease the progress towards the superficies is more quick than its progress towards the centre. In short, this is a law in nature, and it probably is upon the same principle by which vegetables always approach the surface of the earth. In A Treatise on the Blood, Inflammation and Gun-shot Wounds (1794, 1828), 299-300. The time will come when people will travel in stages moved by steam engines, from city to city, almost as fast as birds fly,—fifteen or twenty miles an hour. Passing through the air with such velocity, changing the scene in such rapid succession, will be the most exhilarating exercise. When I was younger, Statistics was the science of large numbers. Now, it seems to me rapidly to be becoming the science of no numbers at all. In Facts From Figures (1951), Chap. 7, 82. Webmaster has not, as yet, identified any earlier primary source. Can you help?